This page is for the original release. For the Enchanted Edition with Trine 2 engine, see Trine Enchanted Edition. Trine Enchanted Edition is an updated version of Trine, which is free to all original owners. Game progress is only saved in-between levels, due to a technical limitation in the game engine. 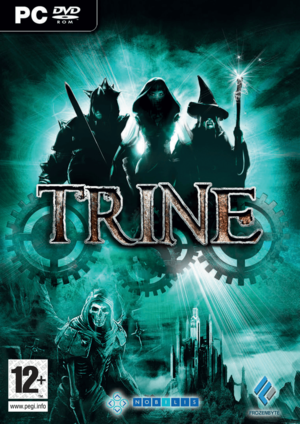 Most places sell the game as Trine Enchanted Edition. The latest patch for the game can be found here. It might be necessary for some versions of the game. Change menu_logo_video_enabled = 1 to menu_logo_video_enabled = 0. Most of the HUD stretches, but the cursor doesn't. The game possibly won't run with 4x AA. Frame rate is capped at 66 FPS. Use the -render_max_fps 0 command line argument. maximize_window = 0 to 1.
windowed = 0 to 1.
window_titlebar = 1 to 0. Xbox controllers are supported, with a mod available for using the Wii's motion controller. If you are having issues with Trine not picking up your mouse, be sure to try disabling Vsync in the launcher. Trine Enchanted Edition has online co-op. Use the -refresh_rate_override 120 command line argument, where 120 is the screen refresh rate. Make sure that you have "enable multiple mice and keyboards" checked. If that does not fix the problem, go to the Trine folder. You can now manually assign mice and keyboards to the correct players by changing the ID numbers. 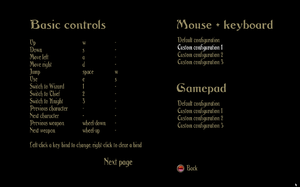 You may have to open and close the game a few times, testing the controls each time, to determine which numbers refer to which mice and keyboards. Be aware that the ID numbers may not perfectly match up as 0's for player 1 and 1's for player 2, etc., as in this example. You may want, for instance, player 1 to have keyboard 2 and mouse 0, depending on what numbers your computer has assigned to which devices. 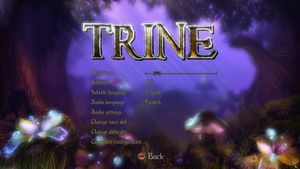 Trine does not run on most Intel integrated graphics chipsets.